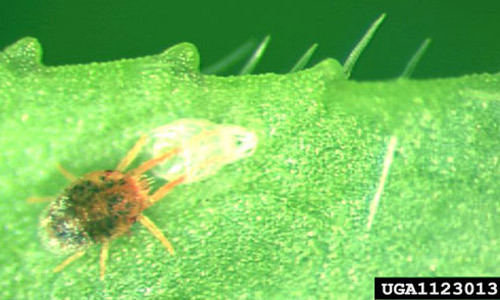 The clover mite, Bryobia praetiosa Koch, is one of the larger plant feeding mites found in the landscape. It often becomes a pest indoors after heavy rain, excessive heat or a change in the season, which stimulate massive numbers to enter buildings. The mites appear as moving dark spots to the naked eye, crawling around walls, windows and doors. Crushing the mites to kill them leaves a large reddish spot. Fortunately, the mites do not reproduce indoors and will die within a few days from dehydration. Although the mites typically invade homes during the spring, they may also appear during cooler periods of the year. Cool summers favor clover mite survival, while warm, dry summers cause inactivity or aestivation. Please note that these large population outbreaks of mites can be confused with similar outbreaks of the predatory mites Balaustium spp. that exhibit a lot of the same behavioral characteristics. They also resemble clover mites in body size and color. At least a 20x hand lens is required to determine the difference between clover mite and the Balaustium spp. Clover mites are widely distributed in North and South America, Europe, Asia, Africa and Australia. Adults: The adults are reddish brown to a dark green-brown color. They are eight-legged, but it is their front pair of legs that makes them distinctive from other mites. The front legs are twice the size of the others and are extended forward near the head. For this reason, many times the front legs are mistaken for antennae. The body is oval-shaped, about 0.75 to 0.85 mm in length and has featherlike plates arranged on the abdomen. Figure 1. Adult clover mite, Bryobia praetiosa Koch, on garden impatiens. Garden impatiens is an unusual host for this mite species. Photograph by Rayanne Lehman, Pennsylvania Department of Agriculture, Bugwood.org. Figure 2. Adult Balaustrium mite. Photograph by Lyle J. Buss, University of Florida. Eggs: The eggs are bright red, spherical shaped, and about 0.12 mm in diameter. Figure 3. 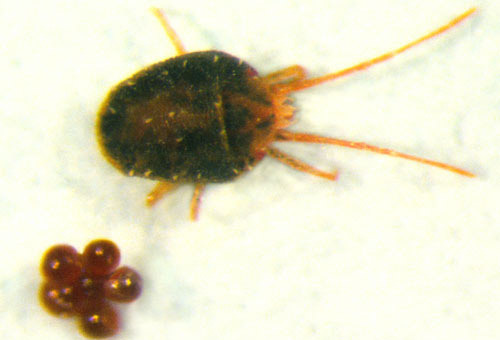 Eggs and adult of the clover mite, Bryobia praetiosa Koch. Photograph by James Kalisch, University of Nebraska – Lincoln. Immature Stages: The larval form is distinctive because its dorsal body setae are longer, slender, and serrate. Larvae are also bright red, disc-shaped and six-legged. Clover mites go through two nymphal stages, protonymph and deutonymph, which are eight-legged like the adults. Figure 4. Molting nymph of the clover mite, Bryobia praetiosa Koch. Photograph by Rayanne Lehman, Pennsylvania Department of Agriculture, Bugwood.org. Clover mites are parthenogenetic, which means that they develop from unfertilized eggs and their population is composed entirely of females. A generation lasts approximately one month. Adult clover mites live for about two weeks outdoors, as long as weather conditions are suitable for their development. Females lay about 70 eggs each, singly or in masses, in dry protected areas with enough sun exposure for them to overwinter during cool temperatures. This provides protection from the summer heat as well as from freezing winter temperatures. The overwintering eggs will hatch and give rise to a spring generation that upon completion will aestivate for the summer. Another generation will be completed in the fall and the resulting offspring will be genetically identical to the mother. Larvae are geotropic so they either move down or drop from the egg site to herbaceous plants where they begin to feed. The mites tend to invade homes and indoor facilities if host plants are dried up or cut off. Once inside, they move upward as the sun warms the surface above them or move to a warm surface until they find a protected area. If the new surface becomes too hot or cold, the mites roam in search of a new, more favorable location. The mites are very sensitive to temperature and may be killed if exposed to temperatures above 39°C. Under temperatures below 24°C, the eggs are stimulated into dormancy. They are generally active during spring and fall and are usually inactive during summer and winter. Clover mites can be especially abundant in heavily fertilized lawns, but have many hosts plants including many different lawn grasses, ornamental flowers, clover, dandelion, shepherd's purse, strawberry, daffodil, salvia, alyssum, and primrose, to name only a few. 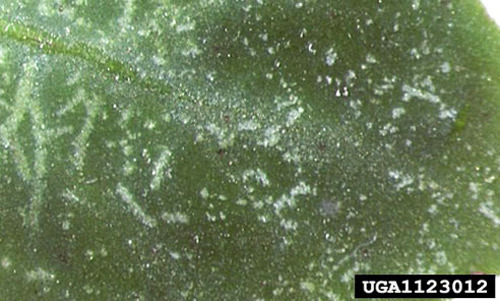 Clover mite feeding damage appears as small, irregular silver streaks in the leaves, but may also occur on flowers. Figure 5. Characteristic feeding damage produced on garden impatiens by the clover mite, Bryobia praetiosa Koch. Garden impatiens is an unusual host for this mite species. Photograph by Rayanne Lehman, Pennsylvania Department of Agriculture, Bugwood.org. When clover mite populations increase, so does damage; large populations can cause areas of a lawn to turn brown and extensively injured foliage usually turns yellow or brown and then wilts. The injury on turf can sometimes be mistaken for winter kill. Figure 6. Damage to lawn caused by clover mites, Bryobia praetiosa Koch. Photograph by University of Nebraska - Lincoln. The most significant problem from clover mites occurs when they move indoors, usually as a result of a dramatic change in weather or habitat factors. Clover mites are not structural pests, do not directly harm people, transmit diseases, damage or feed on clothing, draperies or carpeting, nor do they infest stored products. They do have an annoying effect when crushed, leaving red stains as a result. These stains are sometimes confused with blood and this is why people usually get concerned, thinking they are dealing with a blood sucking insect. 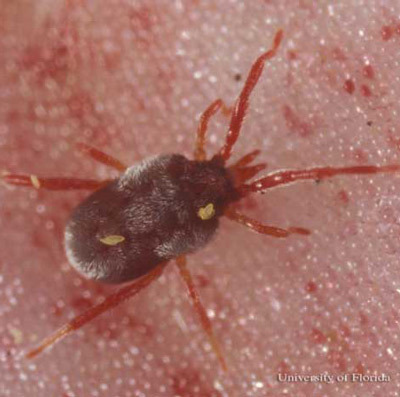 Clover mites are harmless and the red stains are the red pigments from their body fluids. Prevention is the most effective way to control populations of clover mites. To prevent them, the best way is to remove all lush vegetation from the house in an 18 to 24 inch band around the foundation perimeter and sides of buildings. This plant-free zone will discourage mites from movement into building and also provides an easily treatable area. 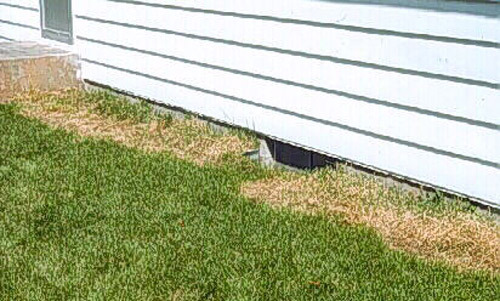 Lawn areas next to foundations, the base of the outside foundation and outward to a distance of 10 to 20 feet, may need insecticide treatment. Treating cracks and holes on buildings in which mites may have crawled can also be very helpful in reducing the problem. A vacuum cleaner is also a helpful way to get rid of clover mites without crushing them. If this method is used, after collecting the mites, the sweeper bag should be destroyed by burning or removing it to a safe disposal area away from buildings to avoid further problems. 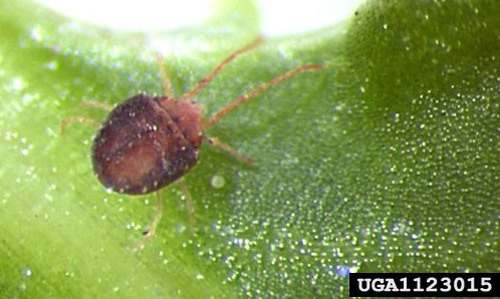 Large populations can also be reduced by providing supplemental watering to areas where clover mites develop, such as dry areas at the base of sun exposed walls and around evergreens. Also, planting flowerbeds with plants that are not attractive to clover mites might be helpful, such as geranium, chrysanthemum, zinnia, marigold, salvia, rose, petunia or shrubs such as barberry, juniper and yew. Bauernfeind R. (2006). Clover mites. Kansas State Research and Extension Insect Library. http://www.oznet.ksu.edu/library/entml2/mf915.pdf (no longer online). Benson EP, Zungoli PA, McLeod Scott J. (2001). Clover mites, home and garden information center. Clemson Extension Home and Garden Information Center. http://www.clemson.edu/extension/publications/entomology/household-structural/clover-mites-hs17.html (21 August 2017). Houseman RM. 2000. Clover mites. University of Missouri Extension — Live and Learn. http://extension.missouri.edu/xplor/agguides/pests/g07358.htm (no longer online). Jacobs S. 2003. Clover mites, Bryobia praetiosa. Np-10. Entomological Notes, Department of Entomology, Pennsylvania State University. Jeppson LR, Keifer HH, Baker EW. 1975. Mites Injurious to Economic Plants. University of California Press. Los Angeles. 129 pp. Townsend L. (2007). Clover mites. University of Kentucky Entomology EntFacts. http://www.ca.uky.edu/entomology/entfacts/ef627.asp (no longer online). Publication Date: June 2008. Last revised: January 2013. Reviewed August 2017.